Hoy es uno de esos dias. A estas horas de la mañana para ser exacto es la 1:56 AM, me he despertado pensando en como ser mas productivo en la vida, como ya saben soy un apasionado por la tecnologia especialmente en la creacion de apps y websites. muchas cosas ruedan en mi mente que no puedo dejar de pensarlas, me estoy confundiendo en que rumbo seguir, Amo lo que hago y nunca me quejo de mi destino, porque si veo que el destino me esta llevando por un camino que no me gusta y que no me beneficia lo cambio y si es requerido renuncio en donde me encuentro dia a dia. yo pienso que es inutil luchar contra la corriente de agua que te aleja de tus sueños cuando al lado hay rios mas ricos y mas poderosos que esperan ayudarte a triunfar. Vive la vida como si fuera el ultimo dia. Vivir la vida como si fuera el ultimo dia no es sinonimo de hacer cosas indevidas, en nuestro pensar a diario tenemos metas e iluciones que un dia deseamos cumplir, luchamos con los problemas a diario y no disfrutamos lo hermoso que es nuestro universo y no comprendemos lo que el futuro y nuestro creador nos ha dado para vivir como esperamos. Algun dia te has preguntado porque en el mundo nunca logramos lo que deseamos? supongo que si, hoy esta mañana me levante pensando porque es tan duro lograr nuestros objetivos, no obstante "No encontre mejor respuesta que" "si no luchas no lo logras". Tomorrow is not the same as today. Every night before going to sleep I take a moment to figure out on what I did wrong all day, because it gives me solution to avoid wrong things on the next day There are no excuses for me, I have started the habit to do right things everyday, do you think it's hard? Sometimes but there is no reason to keep doing the same thing, you have to change the problem to solution, we have to keep in mind all things we do have consequences, If you do good things you will receive good things back. I just want to remember you, YOU HAVE THE POWER TO CHANGE THE WORLD. It has been hard time to me these days I re-design this website from the ground backend and frontend, initially I was developed this website in aspnet webforms in Visual basic.net back in 2012, I did not expect to develop it from the ground but since aspnet webforms and aspnet core are so different I decided to do it, I could continue using the same development as before that doesn't affect the website as Microsoft said webforms will be supported for more time ahead. With this I don't mean having the website on webforms is bad because I've maintained it for more than 5 years, the problem is for the future when you have a lot of more information added to your website will be hard to write it to new development and that was the reason why I've given a new style and new technology to my lovely website. Introducing TimeApp for windows10. Have you waiting for an app that makes time,Money calculation on your business? TimeApp has been developed to help all needs on your business and can be used by individual people, Organization, Stores, freelancers. TimeApp Doesn't Require Suscription or Internet Connection to work with. TimeApp is a timecard app and offer complete Working hours by day and generate report by date range selected, Allowing you to calculate how much the employee has earned by the end of the day,week or date range. You can add as many employee as you need. What you can do with TimeApp? ** Register Company and Company Profile. ** Register Company Work Positions. ** You can configure the clock (puncher) You can determinate the regular hours in a period of day or days you paid and after those regular hours all will be count as Overtime hours Also you can set how much the overtime rate will be: Example Regular Hours are 40 and the employee works 45, you will paid 40 regular hours as the position rate of the employee is registered and 5 overtime hours. ** You can create schedule selecting date period, When you create eschedules you will see how much you will paid by the end of the period. ** Backup Database: You are able to Backup the data base out of the app in case you need in other device, because you can Export the Database and you can Import into TimeApp. 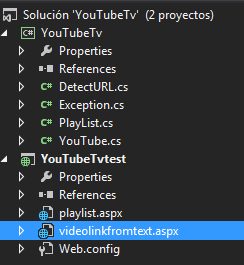 YouTubeTv library allows you to manipulate a Youtube URL, extracts the Video id and the default image from video, and the video URL ready to play in iframe, If you are .Net developer who likes to add Youtube videos to your asp.net website or windows Application, this library can help you to save a lot of coding and time. When we are developing a Windowsphone app that we will submit to the store for first time, everything works fine, we can use our app in the device without installing it (using the debug deployment to the device that Visual Studio creates), as normally as when you deploy to the windowsphone store and install it from there when the app is ready. When you have finished your app and you have published it to the Windowsphone Store, you are able to install it (and you should install it) for first time without any problem even having your debug package installed on the device. and everything is happy for Us :) right?.. 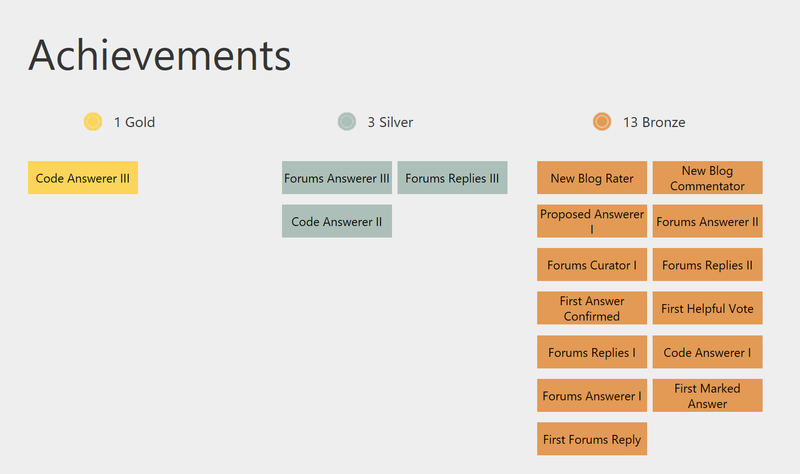 But...... one week after we published our app to Windowsphone store we decided to create updates for the next version that we will publish... There is something that we have to know, the app already has associated information to the app like "AppName", "AppId" that we have created in our dashboard. If you Open Visual Studio and you continue developing the app you will Update. 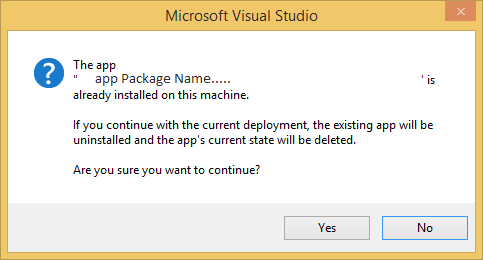 you will notice that when you connect your windowsphone device and you Press the run button on Visual Studio you Will Receive this Windows Message before countinuing to deploy your app in to you windowsphone. Note: you will receive this message if you have installed your app, if not it will run normally. Me siento contento de Contribuir con los Foros de programacion en de MSDN 'Microsoft Developer Network', con duro esfuerzo estudiando libros y creando codigos, Me encanta participar junto a todos los demas voluntarios dispuestos a ayudar en los foros. 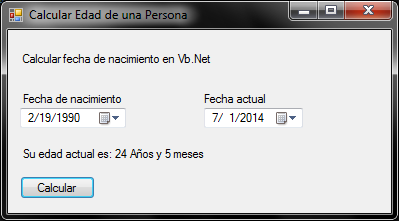 Gracias a MSDN Por estos reconocimientos. No he perdido la nocion de seguir ayudando, un poco dificil se hace cuando el tiempo es corto pero es parte de la vida enseñar lo que uno ha aprendido. Porqué deberias ser un programador? Ser un programador implica ciertos meritos como tambien responsabilidad, dia a dia necesitamos crear innovaciones para trabajo o uso propio, muchas veces para calcular la diferencia entre dos fechas es dificil, Mientras que con pocas lineas de codigos se puede obtener el resultado. Para hacer calculo de una persona es necesario tener la fecha de nacimiento y la fecha final que puede ser la fecha actual o fecha menor pero mayor que la fecha de nacimiento si no obtendra un valor negativo. En el formulario necesitaremos lo siguiente. Me.LabelResult.Text = "Rango de fechas es invalido"
Me.LabelResult.Text = "Su edad actual es: " & CStr(date2.Year - date1.Year) & " Años y " & CStr(date2.Month - date1.Month) & " meses"
En este ejemplo calculamos la edad actual de Años y tambien los meses, porqué calcular los meses? La respuesta seria, suponga que esta trabajando en un hospital y un bebe es recien nacido y lleva su archivo de nacimiento, y usted desea saber cuantos meses lleva de nacido asta la fecha actual, lo mas confiable es contar con un calculador de edades y con sus meses respectivos. Como observamos no requiere de mucho costo hacer calculos con edades en programacion.